Hemodynamic features of chronic constrictive pericarditis during cardiac catheterization Ã¢ÂÂ A case report. Citation: Sondhi S, Sharma R, Merwaha R, et al. Hemodynamic features of chronic constrictive pericarditis during cardiac catheterization – A case report. J Cardiovasc Med Ther. 2017;1(3):3-5. Background: Chronic constrictive pericarditis is completely reversible cause for right-sided heart failure and requires differentiation from restrictive cardiomyopathy. Both of entities come under differential diagnosis of restrictive physiology, which impedes the filling of the ventricular cavity during diastole. Case-description: A 54-year-old male presented with a history of recurrent pedal edema and ascites since last 2 years. He took antitubercular treatment for pulmonary tuberculosis 3 years back. He was having atrial fibrillations and his echocardiogram revealed dilated IVC with poor respiratory variation, grade 3 diastolic dysfunction, septal bounce, exaggerated respiratory variations in mitral and tricuspid inflow velocities and diastolic flow reversal in hepatic vein during expiration and preserved tissue annular velocity of the lateral mitral annulus. Conclusion: CCP is completely reversible cause for right heart failure, a high degree of clinical suspicion and differentiating features on cardiac catheterization study are helpful to differentiate it from restrictive cardiomyopathy which is irreversible cause for right heart failure. Chronic constrictive pericarditis is completely reversible cause for right - sided heart failure and requires differentiation from restrictive cardiomyopathy. Both of entities come under differential diagnosis of restrictive physiology, which impedes the filling of the ventricular cavity during diastole. 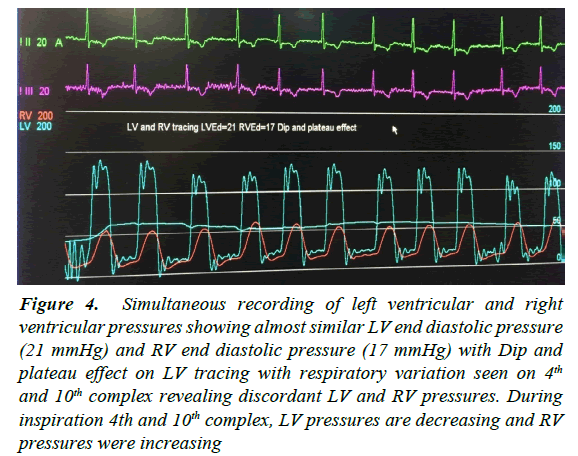 There is patho physiologic similarity between restriction and constriction as abnormally elevated ventricular pressures impede the filling of left ventricular to normal end diastolic volume. The restriction is due to myocardial disorder whereas constriction is due to the involvement of pericardium. Differentiation is based on findings of echocardiography and cardiac catheterization and pericardial thickness on CT/MRI. A 54-year-old male presented with a history of recurrent pedal edema and ascites since last 2 years. He took antitubercular treatment for pulmonary tuberculosis 3 years back. He was having atrial fibrillations and his echocardiogram revealed dilated IVC with poor respiratory variation, grade 3 diastolic dysfunction, septal bounce, exaggerated respiratory variations in mitral and tricuspid inflow velocities and diastolic flow reversal in hepatic vein during expiration and preserved tissue annular velocity of the lateral mitral annulus. He was taken for cardiac catheterization, right atrium pressures tracing showed elevation in mean RA pressure with prominent Y descent and preserved X descent with characteristic M contour (Figure 1), inspiratory increase in RA pressures revealing kusmaul sign (Figure 2), PA pressures were 41/18/28 mmHg (Figure 3), Simultaneous tracing of LV and RV showed elevated and almost similar LVEDP and RVEDP with difference less than 5 mmHg and dip and plateau effect (Figure 4) and ventricular interdependence (Figure 5). Pressures in cardiac chambers were described in Table 1. Equal RA mean pressure, RV end diastolic pressure, PA diastolic pressure, pulmonary capillary wedge pressure (PCWP) and LV end diastolic pressure with ventricular interdependence, filling pressures less than 25 and PA systolic pressures less than 60 favoured the diagnosis of chronic constrictive pericarditis and patient sent for Pericardiectomy. The patient is doing well at 6 months follow up visit. Figure 1: Right atrium pressure tracing showing elevated right atrium mean pressure with prominent Y descent and preserved Y descent with M shaped contour. Figure 2: Right atrium pressure tracing showing fall in right atrium pressure during expiration and rise during inspiration revealing kusmaul sign. Figure 3: Pulmonary artery pressure was 41/18/28 (s/d/m) mm Hg. Figure 5: Left ventricle and right ventricle tracing showing ventricular interdependence. Table 1: Pressure data in cardiac chambers revealed equal RA (mean), RVEDP, LVEDP, PA diastolic and PCWP. Chronic constrictive pericarditis CCP is a chronic insidious inflammatory disorder of pericardium leading to thickening, calcification, and adherence of visceral and parietal pericardium resulting in a thick shell surrounding the heart. 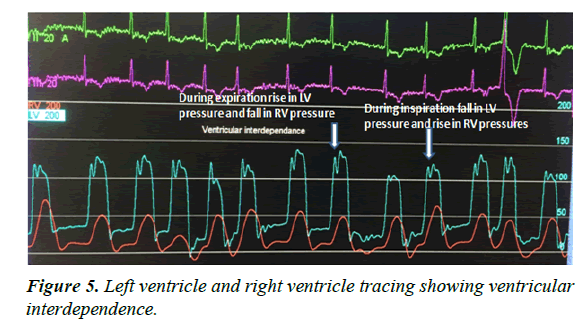 During inspiration there is failure of transmission of negative intrathoracic pressure to cardiac chambers, but as pulmonary veins are extra pericardial so negative intrathoracic pressures during inspiration are transmitted to pulmonary veins resulting in decreased gradient between pulmonary vein and left sided chambers so less filling of left sided chambers during inspiration and other hand increased RV filling during inspiration. During expiration, there is increased LV filling and decreased RV filling. This respiratory variation in LV and RV filling results in the septal bounce . In CCP all filling of ventricle takes place during early diastole after that there is an abrupt halt in filling due to pericardial constraint (resulting in pericardial knock). So due to exaggerated early diastolic filling, there is rapid Y descent on RA tracing and dip and plateau effect on ventricular tracing. As management is different, it should be differentiated from restrictive cardiomyopathy (RCMP) in which restriction to ventricular filling is due to the myocardial involvement and this restriction is throughout diastole . Differences in RCMP and CCP are illustrated in Table 2. Table 2: Hemodynamic features of constrictive pericarditis and restrictive cardiomyopathy. Etiology include tuberculosis, post cardiac surgery, malignancy, radiotherapy and idiopathic. Diagnosis may be challenging but can be usually made with the high index of suspicion in any patient with unexplained right heart failure. Elevated JVP with prominent Y decent, ascites out of proportion to pedal edema favours CCP. Echocardiogram reveals significant respiratory variation in transmitral and tricuspid Doppler flow velocities, expiratory flow reversal in hepatic venous Doppler, dilated IVC, grade 4 diastolic dysfunction, preserved mitral annulus tissue Doppler velocity and increased lateral annulus velocity than medial annulus velocity (annulus reversus). Cardiac catheterization is usually mandatory for confirming the diagnosis which demonstrates prominent Y decent and kusmaul sign on RA tracing with characteristic M pattern, elevated and equal left and right sided pressures, dip and plateau effect, discordant LV and RV pressures with respiratory variation . CT/MRI can be done to look for pericardial thickness and to delineate aetiology. Treatment of choice is pericardiectomy . CCP is completely reversible cause for right heart failure, a high degree of clinical suspicion and differentiating features on cardiac catheterization study are helpful to differentiate it from restrictive cardiomyopathy which is irreversible cause for right heart failure. Myers RB, Spodick DH. Constrictive pericarditis: Clinical and pathophysiologic characteristics. Am Heart J. 1999;138(2):219-32. Bashi VV, John S, Ravikumar E, et al. Early and late results of pericardiectomy in 118 cases of constrictive pericarditis. Thorax. 1998;43(8):637-41.